Higashiyama　東山 "East Mountain" is a location in many parts of Japan. 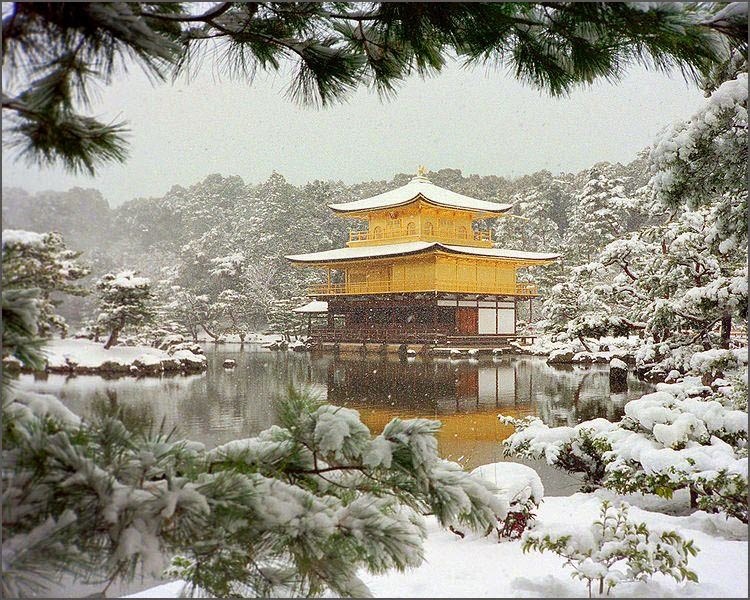 The Higashiyama Culture of Kyoto is best represented through the most famous Silver Pavillon, Ginkaku-Ji 銀閣寺. Higashiyama Bunka (東山文化, lit. "culture of the Eastern Mountain") is a certain segment of Japanese culture originated and promoted in the 15th century by the Shogun Ashikaga Yoshimasa (1435 - 1490). Based largely on the ideals and aesthetics of Zen Buddhism and the concept of wabi-sabi (beauty in simplicity), Higashiyama Bunka centered on the development of Sado (Japanese tea ceremony), ikebana (flower arranging), Noh drama, and sumi-e ink painting. Much of what is commonly seen today as traditional Japanese culture originated or developed in this period. Yoshimasa's retirement villa, Ginkaku-ji (the Silver Pavilion), situated in Kyoto's Sakyō-ku, was the center of this cultural outgrowth in a number of ways. The Pavilion is revered for its simple beauty, the silver having never been added. The rock garden next to it is likewise one of the most famous in Japan, and praised for its Zen and wabi-sabi aesthetics. 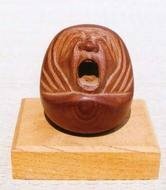 It is a quintessential example of the idea that only the trained expert should be able to recognize the subtle beauty within art and architecture; the beauty of the object should not be underscored and emphasized, but gently hidden. The retired shogun also invited many artists, poets, and court nobles to his villa, encouraging the development of their arts. The Ginkaku-ji was designed as a tea house, its architecture and limited decoration meant to enhance the experience of those taking part in tea ceremony. There were many architectural innovations in this period, exhibited in the Ginkaku-ji in particular, which would later become core elements in the shoin style of 17th century architecture. One of these elements was the tokonoma, a small alcove in which scrolls are hung, and flowers or other small articles are placed to enhance the aesthetic feel of the room. The great ink-painter Sesshu spent much time at the Ginkaku-ji, and this period also saw the birth of the Kano school of Japanese painting as well as an early version of chanoyu tea ceremony. Tea ceremony would be further formalized by Sen no Rikyu in the 16th century. Yoshimitsu united the Northern and Southern Court (Nanboku-cho) in 1392, ending the over 50 year long Northern and Southern Court Period. This finally firmly established the authority of the Muromachi shogunate and suppressed the power of the regional daimyo. In 1394, Yoshimitsu retired and his son became the fourth shogun Ashikaga Yoshimochi. However, Yoshimitsu still maintained authority over the shogunate until his death. In 1404, Chinese Ming Dynasty sent Zheng He to Japan in a diplomatic trip. Ming Dynasty entitled Yoshimitsu "The King of Japan" and presented him a "The King of Japan" seal, which he accepted. Yoshimitsu replied in letter ending with "The King of Japan, your vassal Yoshimitsu" willing to improve relations with China and profit from trades, in what the Chinese considered tribute. Yoshimitsu died in 1408. His villa became Rokuon-ji, which today is famous for its three-storied, gold-covered reliquary known as "Kinkaku." 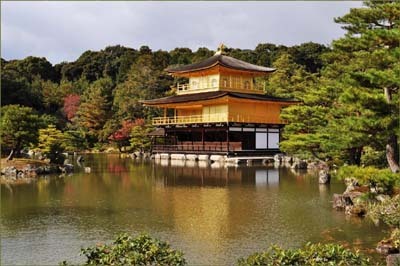 So famous is this single structure, in fact, that the entire temple itself is often (mistakenly) called Kinkaku-ji　金閣寺, the Temple of the Golden Pavilion. From the Hondo and Togu-do if you turn around you can see the first part of the grand garden. This garden is divided into two parts, though the first part may not really seem like the image of a garden that you have in mind. This is a karaesanisui garden (dry garden) called Ginshaden or the Sea of Silver Sand. The "garden" consists of a 2 foot platform of sand that covers 0.71 hectares (1.75 acres) that is meant to be viewed as a sea, though the lines are far too straight and perfect to create such a clear illusion. Despite this, it is truly a wonderful sight that you can lose yourself in. The highly labor intensive maintenance of the garden requires that the platform walls be reshaped and the garden re-raked everyday. Watching the temple staff reshape the walls you can easily develop an immediate appreciation for the work of art before you. Though amazing at any time of the day, the best view of the garden is said to be at night with a full moon shining on the sand, making it truly resemble a calm, peaceful, silver sea. Next to the sea of sand you can see a cone shaped structure rising 2 meters into the air. This is called the Kogetsudai, or Moon-viewing Platform. There are several theories about this mountain shaped creation. Some believe it is meant to resemble Mount Fuji, while others say it was designed as a simple mound of sand used to replenish the walkways. Still others say that the cones of this type (they are located in other temples in Japan) are meant to reflect divine light into the hearts of the visitors. No matter what the true purpose is, the Kogetsudai illuminates the Silver Pavilion on moonlight nights, making for a magnificent sight. In addition, it is said that from above the Silver Pavilion the Kogetsudai upon the Ginshaden resembles the silvery full moon reflected in a deep lake. It is said that the famous landscape gardener Soami (1455-1525) personally designed the garden and buildings of Ginkaku-ji. Soami is believed to have been the greatest landscape artist in medieval Japan and having his name attached to a temple in any way grants immediate distinction and prestige. However there is no mention of the sand structures existing before the renovations of the Edo period, which began almost 100 years after Soami's death. This discrepancy is not uncommon in Japanese history, especially that of temples. Coming down from the path you walk by the pond which is called Kinkyo-chi or Brocade Mirror Pond. There are two small islands called Crane and Turtle Islands. Cranes and turtles are both symbols of longevity. The islands (and some real turtles of course) float peacefully in the pond and there are several rocks, as mentioned before, scattered in and around the pond. Each of the stones has a name - for example the large stone in the center of the pond is known as "Ecstatic Contemplation" while another forms a stone bridge called the "Bridge of the pillar of the Immortal". Take your time around the pond soaking in the views. Each view is meant to conjure an image from classic Japanese or Chinese literature. The pond is completed by a small waterfall called Sengetsu-sei (moon watching fountain). The tiny trickle of water from this fall is designed to spread ripples across the water - the reflection of the moon in the water, combined with the reflection of the moonlight on the sand garden is one the highlights of Ginkakuji. From the time of the first Ashikaga shogun Takauji, the Ashikaga shoguns displayed an intense interest in art collection and connoisseurship. Yoshimtsu (1358 - 1408) in particular promoted trade with Ming China and acquired many works of art in the process. In fact, the majority of the great paintings, ceramics, and calligraphic works brought to Japan from China were carried back by Zen monks who had gone to China to study. 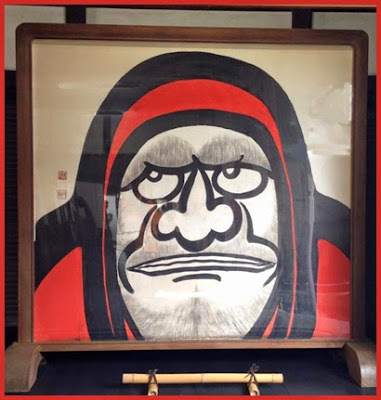 Stored in the treasuries of the great Zen monasteries, most of these works were requisitioned by the Ashikaga shoguns and became the property of the shogunate. Yoshimasa engaged Nôami (1397-1471), a dôbôshu, or professional connoisseur of art objects, and his son Geiami (1431-85) to attempt to examine and catalogue the shogunate's collection held in the storehouses of Higashiyama palace. At the same time Yoshimasa ordered Noami to develop standards for the new shoin style of architecture that was emerging at this time, a project that was completed by the time of Noami's grandson, Sôami (1485?-1525). Nôami also contributed to the development of the art of the tea ceremony (chanoyu), studying under one of its early formulators Murata Jûkô (also Shûkô, 1422-1502), and recommended Jûkô to Yoshimasa.
. Ashikaga Takauji 足利尊氏 (1305 – 1358) .
. Shogun Jizo 勝軍地蔵 Victorious Jizo . izumidono 泉殿 (いずみどの) "room near the spring"
tsuridono 釣殿（つりどの） "room for fishing"
Since the Fujiwara time, it was common to have a special room facing east to the main living quaters, where the lord of the mansion could enjoy some cool in summer. The the west of the main mansion was another special room, were the lord and his visitors could enjoy fishing (tsuridono) and moon viewing (kangetsu 観月, tsukimi　月見). These rooms for enjoying the cool in summer were also called "room with water". takidono 滝殿 (たきどの) "room to view the waterfall"
Artificial waterfalls were quite popular to evoke the feeling of coolness in summer. refers to the style of domestic architecture developed for palatial or aristocratic mansions built in Heian-kyō (平安京, today's Kyoto) in the Heian period (794-1185), especially in 10th century Japan. Shinden-zukuri developed into shoin-zukuri (shoinzukuri) and sukiya-zukuri (sukiyazukuri, detached teahouse type architecture). During the Kamakura era, it developed into buke-zukuri (武家造 housing for a military family). The main characteristics of the shinden-zukuri are a special symmetry of the group of buildings and undeveloped space between them. A mansion was usually set on a one chō (町, 109.1 m2) square. The main building, the shinden (寝殿, sleeping palace), is on the central north-south axis and faces south on an open courtyard. Two subsidiary buildings, the tai-no-ya (對屋・対屋, lit. opposing rooms), are built to the right and left of the shinden, both running east-west. The tai-no-ya and the shinden are connected by two corridors called respectively sukiwatadono (透渡殿) and watadono (渡殿). A chūmon-rō (中門廊, central gate corridor) at the half-way points of the two corridors lead to a south courtyard, where many ceremonies were celebrated. From the watadono, narrow corridors extend south and end in tsuridono, small pavilions that travel in a U-shape around the courtyard. Wealthier aristocrats built more buildings behind the shinden and tai-no-ya.
. . . CLICK here for shindenzukuri Photos ! is one of the eleven wards in the city of Kyoto, in Kyoto Prefecture, Japan. It was created in 1929 when it was split off from Shimogyō-ku. During the years 1931 to 1976 it also covered the area of present-day Yamashina-ku, which was an independent town until its merger into the city in 1931. The name literally means "Eastern Mountain District". 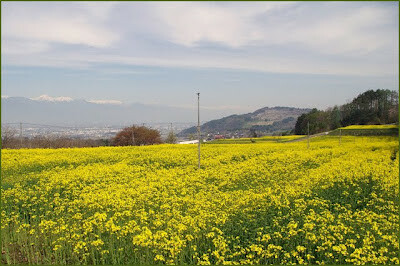 Higashiyama and "mountain with a temple"
In Nagano, from from Matsumoto to Shirojiri town there is a road of this name. Higashi no Yamamichi road passed here. Tōsandō (東山道, literally, "eastern mountain province, region, district") was an old Japanese geographical region that made up the gokishichidō system and was situated along the central mountains of northern Honshū, Tōhoku region. This term also refers to a series of roads that connected the capitals (国府, kokufu) of each of the provinces that made up the region.
. WKD : akeyasushi　明易し "dawn comes early" . Kinkaku-Ji - 金閣寺 "Temple of the Golden Pavilion"
officially named Rokuon-ji (鹿苑寺, lit. "Deer Garden Temple"
During the reconstruction in 1955, it had to be replaced however by more than one board.
. Amulets from Kinkaku-Ji - 金閣寺 .
. Yosa Buson　与謝蕪村　in Edo . According to Sakuo Nakamura, Higashiyama ("Eastern Mountains") is the collective name for a number of mountains located between Kyoto and Lake Biwa: a total of 36 peaks, one of which is the temple mountain, Hieizan. Shinji Ogawa assisted with this translation. What if Columbus had reached his goal: Japan? In 1473, as the war raged, Yoshimasa abdicated and turned to what he loved and knew best: art. Japan’s most characteristic art forms — tea-ceremony, noh drama, 31-syllable poetry, linked verse, flower-arranging, moon-viewing, monochrome painting, calligraphy, landscape gardening — all bear Yoshimasa’s stamp. The Higashiyama culture he spawned draws its name from the Higashiyama Hills of Kyoto, where in retirement he built a palace he named Ginkaku-ji (Temple of the Silver Pavilion). Starkly, almost startlingly austere, its name is misleading — not a description (there is no silver) but a mocking rejection of the golden opulence his grandfather Yoshimitsu embodied in the Kinkaku-ji. Raised in luxury himself, accused by contemporary chroniclers of callous indifference to the suffering of the poor, Yoshimasa went on to fashion at Ginkaku-ji an artistic legacy that sought beauty in simplicity, fulfillment in poverty, happiness in sadness. 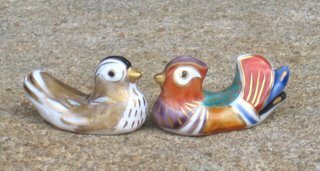 The Japanese word that expresses these qualities is wabi — the spiritual peace of material renunciation. What would Columbus have made of this — or Yoshimasa of Columbus, and of Europe’s rapacious avarice, insatiable curiosity and globe-girdling restlessness? made of wooden boards (sugi ceder) in the size and pattern of the tatami in the roof below, often for 4 or 6 tatami rooms. Still looking for a photo !